I had to share this today to ask that you NEVER text while driving again. I know I won't. More on Chris Medina! Good stuff! Being the "inquiring mind' that I am, I googled "Chris Medina" to see if I could find out more about Julie's condition and more songs Chris has recorded. Here is one more video I found that has both (recorded on what should have been their wedding day). If you have not yet read my post from Thursday, scroll down and read and watch that video first for context! I also found that their wedding is on hold because of the incredible medical expenses they've incurred and continue to have for her recovery. Here is a link to Juliana's Recovery Fund through the Laurus Foundation if you feel moved to contribute, you can easily make a payment through the widget on the site, any amount would help. I am so excited to see more of them! I know his time on the show will be really hard for them to be separated and her mother will need lots of prayers to manage what she normally has Chris's help for in Juliana's day to day care, but I am hoping for miracles for the three of them in many ways! PS Can't wait to start downloading his songs off itunes. I went to download "Breakeven" last night but prefer Chris's soulful acapella rendition so much more, so I CAN wait, maybe he'll sing this or get permission to do one of his original songs on the Idol Stage, they are making lots of changes this season so perhaps allowing new songs will be one of them! PPS Nicole commented on how amazing Steven Tyler was showering love on her after that audition, I completely agree. It revealed what a HUGE heart he has. Thumbs up adding him to the show! I used "Buds and Vases" this week, and have a coloring tutorial to go with! First color the flowers with R29, Lipstick Red goes beautifully with the Pure Luxury Red Hot. Next color the leaves with YG93. Now trace the veins and under the flowers where they overlap the leaves with G99. You could soften these lines with YG93 again or do tip tip coloring with these two greens to create an in-between shade. Next, using R59, start near the flower centers and make quick flicks outward, going over the little star burst lines in the middle of each. Leave the centers white. Last, and this step is optional, start on the outside of the flower petal and make tiny flicks inward toward the flower middle to create a frilly look. Without the petals look flat (which is cool, some varieties look like that!) With these strokes, the petals have some folds. Here is a closeup, the pot is paper pieced with Basic Grey Origin DP and shaded at the bottom, left and under the rim with E71, but W or C gray Copics would work as well. I popped up the flower and trio and added one cut blossom over and one under. The Black Onyx layer is Cuttlebugged with the Victoria folder, rubbed with white craft ink and the center is cut out with a Large Scalloped Rectangle die to reveal the white layer underneath. I used a Bow Easy to create the double bow with the Pure Luxury Satin Ribbon. Be sure to use the tag STVCSP10 to the STV gallery, I hope you'll play, you could snag from free stamps, good luck! Have a terrific weekend! Thank you for visiting me! ...when I watched American Idol tonight, this segment with Chris Medina is worth watching multiple times, because he sings like an angel, but also for his story of incredible commitment and love. LOVE. THIS. GUY. My husband left the room before Chris brought his girlfriend in to meet the judges, and I thought it was because he just didn't want to get choked up (he's a sentimental guy but tried hard to hide it). As the show went to commercial I suddenly realized how easily OUR story could have ended this way. You may have read my post last September about how I got in a terrible car wreck one month before we got married (we'd been engaged about a year and a half). I walked away from it. Because I suffered no injuries, I think I've always viewed it as how fortunate I was to survive, that it was life or death, but I'm not sure if I've ever thought until tonight in terms of how I also could have lived but become quadriplegic, or suffered serious brain trauma like Chris' fiancee did... I shiver thinking about it again. But what a testament this video is to what love is and what it can do. Excuse me while I go watch it again... (sniffle) and then go download the song (wahhh!) Hope it lifts you up if you weren't watching it tonight and I've helped round up some more fans for him. ;) Go Chris!! Okay, this really has me tickled , Elfrieda and Karen seem to have a little throw down going on over (whether they know it or not! LOL!) at STV for the most creative use of "Where Your Heart Is". Here is Elfreida's latest creation, 'just a little note' (hee!) using the letter image from the set "Picture It"
And look at this one, bwahhhhhhhhhhhhh! I seriously spit on my screen (in a good way!) when I saw the hands split and holding this tiny, wee confection, from "Candles on Your Cake"! Be sure to check out Karen's blog for the inspiration pic she used and materials on her card! become a follower while you're there, cause Karen's stuff ROCKS! Thanks for inspiring me ladies, I bow! Gotta try to make my own out of the box creation now, I don't want to miss out on this fun! How about you?? Hope this inspires YOU! Congrats Melissa! Please send me your snail addy and I will ship the stamps to you when I receive them! Our next release is February 17th, and I am so, SO excited for this one!! :) Thank you again everyone for linking me and helping spread the words about the PBS spot! and tired of their shade"
Don't let people steal your sunshine! Chocolove: I'm a sucker for it! Is that gorgeous, or what?? This turquoise jar, made from my stamp set "Buds and Vases" looks so fabulous with the Labels 14 wrap from "Labelled with Love" and these handmade chocolate suckers Sue created with punches! Looks like soemthing in oan old timey candy store, a candy store I'd like to go in!! The tiny hearts balance out the pops. I just love, love, LOVE this!! Hope it inspires you to see what YOU would/could put in this jar! :) Thanks, Sue for shairng your talents and ideas with us today! You can find the full list of materials Sue used HERE. Happy Monday! I hope you all had a great weekend! Time for our 10th Sketch Spotlight Challenge! (I think Gina made this one for my ""Where Your Heart Is set) ;) I used Innocent Pink for the base and focal point and some fun, contemporary looking Valentine-y DPs by The Paper Studio I found at Hobby Lobby. Mats are Pure Luxury Black Onyx. TIP: I stamped the hands right onto the Innocent Pink and colored them with Copics E02 and E51. It will look SO dark as you start to lay the color down but it WILL fade. You will not get such a natural looking effect if you try this on blue or green cardstock, just sayin' LOL! But working on pink since it's close to a flesh tone is great for girly, love-y cards, and keeps you from having to color the background. I trimmed it to have about 11/8" inch around the border and ran my Copic R27 around the outside of the line to look like I have an extra red layer. I also cut one of the hearts out of the DP and popped it up over the heart shape instead of coloring, isn't that a fun look? This is another alternative to coloring in or paper piecing the heart shape, the fit of your punched heart or heart cut out doesn't exactly have to match the space in between the hands! Last I stamped "i love you" from the "Where Your Heart Is" set onto plain white printer paper instead of cardstock so it has more of a fortune /love note feel. I found these cute little clips at the Target Dollar Spot in different Valentine colors, isn't that sweet? Sometimes the smallest little bling detail is all you need! Hope you'll join us in playing this week's Sketch Spotlight Challenge on STV, be sure to upload your creations with the tag STVSKSP10. Looking forward to seeing what you make, you might win some free stamps! In case you were wondering where the usual guest design spots have been this month, never fear, they are on the way! I wasn't able to get sets out to my designers as quickly as usual, but they will have some things to share soon! 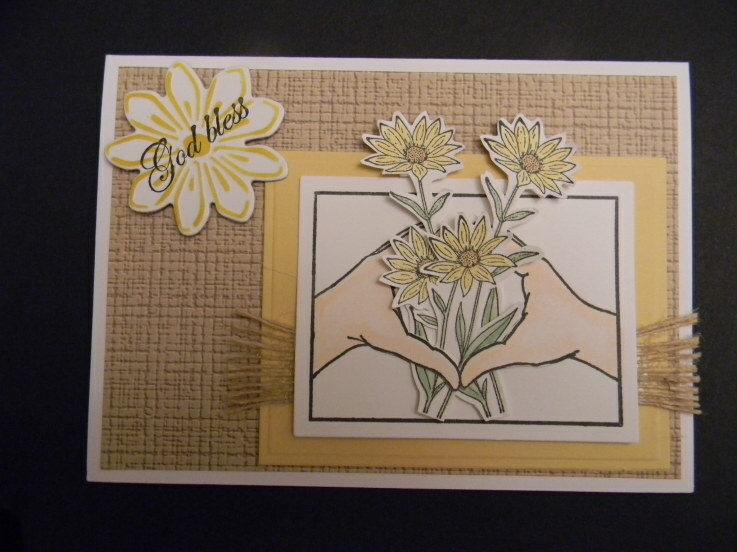 Fortunately, I can always rely on finding beautiful , creative samples in the StampTV gallery from our fans and customers any time, so I thought I'd point out two terrific ideas I spotted this weekend using "Where Your Heart Is", both from Elfrieda Everett !! These were FIRST uploads in our STV gallery and I hope she will continue to delight us with ideas like these! 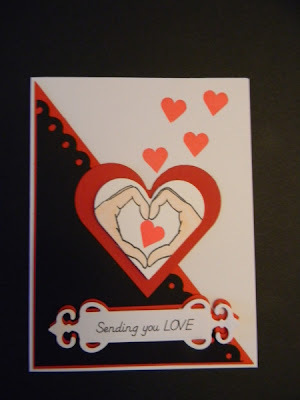 Here she used the hands image on card for the current sketch challenge, and I just love the whimsy she created with those bold hearts from "Picture It" stamped again and again bubbling up out of the middle! How perfect for a Valentine or for any time, just makes me feel warm and fuzzy inside! *For the first time in days I'm inspired, can you pray for me, please, so I can get back to stamping?? I have been having real issues with my neck that is causing a lot of pain to sit at my desk and I'm noticing it's starting to affect my right hand again (had some pinched nerve in my neck last year that caused a lot of pain and numbness in my wrist and thumb), trying to take it really easy and do my stretching! More samples soon to come! Blog Candy Winner from Friday! Now a BIG oops I just noticed: on the post with the PBS videos when I asked you to share them on your blog or Facebook, I meant to put "I will post a winner next Tuesday", but I JUST noticed it says "I will post the winner next day!" doh!! I must have been trying to decide how long to leave it open and forgot to add! So anyway, I WILL post it Tuesday! Still time to link the videos or post to win my set coming out in February, please scroll down to Tuesday's post to enter! Sorry again for the omission! Hello! 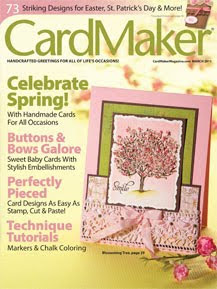 Have you seen the newest issue of Cardmaker? Their March issue is packed with all things Spring, plus some other fun techniques! 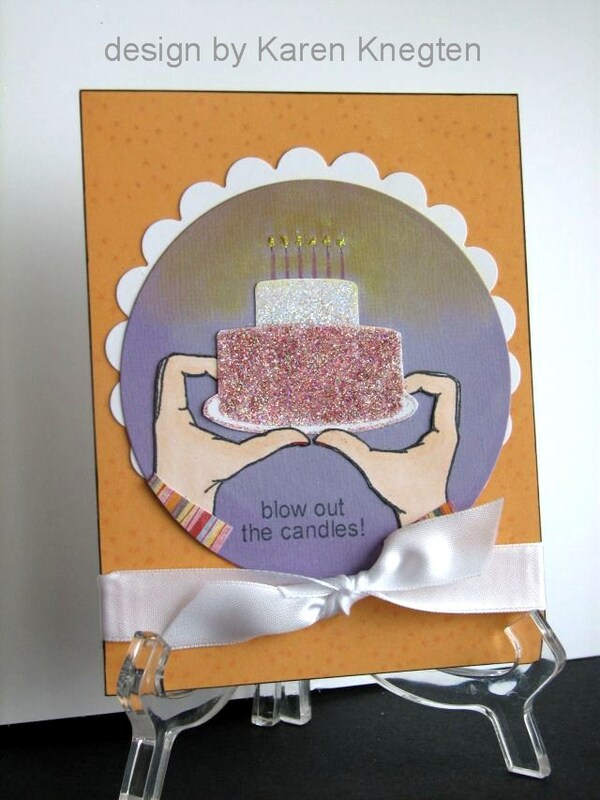 Featured on page 22, is one of my favorite intereactive designs I've created, a birthday blowout using "Candles on Your Cake"! A big hip hip hurray to our other Gina K Designs team members in the issue! I have an EXTRA copy of the issue to give away to one of you, tell me a birthday wish you made (come on, I know you still make them before you blow out those candles!) that came TRUE! I will leave this open for a few days and pick a winner on Friday! "OMGoodness!!!!!!!!!!!!!!!!!!!!!!!!!! (her words!!) "Your "Arranged with Love" stamps are on "Scrapbook Memories" on PBS RIGHT NOW!" You can check the "Scrapbook Memories" site's program guide to find out when the full episodes will air again on PBS, OR you can watch the clip with just my stamps, RIGHT NOW (there is also one with "A Year of Flowers"!) from youtube! Here they are below, enjoy learning how to watercolor with glitter pens and how to make clear embellishments with transparencies, courtesy of Julie Fei-Fan Balzer! Using "A Year of Flowers"
I am still so excited and honored that out of all the stamps out of there that could have been selected to show these techniques, they chose *mine* from Gina K Designs! So blessed! Thanks again Patricia for the heads up!! Made my week! Would you like to win my upcoming stamp set from our next release? (Think Spring!) Help me spread the word by linking this post (you can also embed the video or pdf if you like) on your blog or Facebook account. Two entries if you post to both! Just come back here and leave the links back to your posts in the comments section, I will announce a winner next day! Thanks in advance! It's Monday!! Time for another Sketch Spotlight Challenge with Gina K on StampTV! Be sure to upload your creations to the STV gallery with the tag STVSKSP9, hope you'll play along for a chance to win a free set! I used the sketch to make a special Valentine for my son's kindergarten teacher. I found this cute sheet of vintage valentine paper from The Paper Studio at Hobby Lobby, always get so nostalgic for making homemade Valentines and decorating bags to put them in back in elementary school this time of year! Glad my kids give me LOTS of excuses to keep making crafts like those! I trimmed it so I'd have this little blond boy (who looks like William!) saying, "I've the nicest teacher in the world." (The girl above that looks like his blonde teacher, too, how about that?!) It's REALLY helpful to check out the details in your patterned paper before you start cutting to find the best parts for your particular design. The Black Onyx layer is Cuttlebugged with Numbers Collage and swiped a Cream White ink pad over the embossing to look like black board, isn't than fun? Sponge the Beaded Circle lightly with Antique Linen ink and add your stamped hands from "Where Your Heart is". I colored the hands with E51 and E02 (this color is a little pinker/peachier than the ones I've used on other posts, I wanted to give the little boys hands a slightly ruddier look) I pieced the heart middle with Red Hot to match the little "I love you" sentiment and cardbase, wanted a more opaque look as if you were cutting out little red hearts from construction paper. Pure Luxury White layer under the black mat is sponged with the Antqiue Linen as well to match the DP. I can't wait to make more Valentines with this set! I got some trendy heart paper too so I'll be making some with designs with that as well! Hope you had a great weekend, ours is still going with the MLK holiday! Here are tips to help you create with "Where Your Heart Is". Use the greetings and image together or separately any time you want to lift some one up by letting them know how much care, whether that's to thank someone for their hard work, time, love and/or commitment or to let someone know you are praying for them. The phrases below show you how to put the different words together, there may be more sentiments that I show here. Enjoy stacking your sentiments in different ways to fit your different shaped and sized die cuts or tags, or use a stamp positioner to stamp them out in a long line. God bless you/your family for all you do! God bless you/your family for the example you set! Thanks for the example you set! Your prayers/letters/pictures mean everything to me! Your sacrifice is everything to me! Our family is everything to me! Omit the"r' in "Your" by inking the remainder of the long sentiment to say "You mean everything to me! "Or use the separate "You" provided and then just ink up "mean everything to me!" Color in the heart to make it stand out or paper piece it with patterned papers. Paper piece the background with patterned papers for sponge or fill in with the color medium of you choice. Create sleeves on each side of the wrists to make sleeves. Make them larger by male hands and narrower for female hands. The classic style of the fonts will go on any card, beautifully with your patterned paper or other images, even without using the hands image. Pop up the hands for more dimension. The rectangle was designed to fit the Rectangle Nestabilities. Enjoy cutting after stamping your image and use larger dies when you want a lager border around the edge. These die cuts will them mat beautifully onto the other Rectangle dies: Deckled Edge, Scalloped, Big Scalloped etc. You can also easily crop the hands into a square by trimming off the rectangle border with a paper trimmer or using a square die or punch. Stamps the hands in brown, black or gray before coloring, in whichever best suits your projects color scheme or ink up the hands in a tan or peach before coloring for a softer look. Leave the hands uncolored and just color in the heart to really make the heart pop. Stamp a heart shaped image into the heart space. try adding little heart shaped embellishments like buttons, rhinestones or stickers to emphasize the message of love. Accent the image by adding heart shaped punches or die cuts to your project, layering it over the hearts, surrounding it or adding just one of two at the corners. For a quick single layer cards, stamp image onto Pure Luxury base weight cardstock, and emboss a shaped around it. Stamp the single words like "Us" "You" or "i love you" phrase inside the heart. You can also cut out the hands and heart space in between them, then pop them up with heart shape window centered over the stamped word. The cut out hands are also sweet over a photo, centering the open heart over someone's face or two faces. There is room above and below the pair of hands to stamp your phrases, for example praying for" along the top left with "your family" along the bottom right corner. You can also stamp the words above below, or going around the corner around the outside of the rectangle. The hands can fit virtually any shaped die if you ink up the hands only, omitting the rectangle outline, then stamp onto cardstock. Now place your shaped die around, finding a die that fits to the edge of the wrist and die cut. Color as desired. Create little personal effects to add bling and customize the hands by creating bracelets form adhesive pearls, rhinestones, colored string, wire etc. Make a beautiful accent for your scrapbook pages. Color the hands to match your own. Or for a wedding or anniversary, color them to match the recipients, very personal to make one hand in the skin tone of each so that the card shows their two hands coming together to form *love*! Watermark it onto your card backgrounds or inside your cards to send a sweet and subtle (almost subliminal , hee!) message. Create small note cards with the image and tuck into your purse to have on hand when you come across someone who might need a little boost, like little random acts of kindness. How fun to pass one off to the sweet librarian or cashier you've been going to for years to let them know "I love you positive attitude each day! Keep up the good work!" Tuck little cards with this image into you kids lunch boxes, on DH's pillow, inside his briefcase, car etc. You can feel like it's Valentine's Day any day! Make fun treatholders for Valentines or little any time gifts. As always this is just to get your creative juices flowing. Sorry for the delay in posting these basics! I will continue to give you tips for the set as well as new samples illustrating the ideas above along with more layouts and design ideas. The First, the Last, and Everywhere in Between! I have to thank Lagene for blessing me with this video today, of an 11 year old who reveals Jesus' presence and role in every book of the Bible (in under 4 minutes!) It really moved me to tears several times to be reminded of all the things Jesus does for us and all the power and goodness that's available to us, God really thought of everything. :) I'm going to watch it again (with lots of pausing!) and jot down a list of these next to all the books because I think it will be a great directory so to speak when I'm expecially needing "peace", " a burden bearer", etc, it points to me a specific book to go read, meditate and pray over. I love the one to few word descriptions he provides for each that just sum it all up! Do you have a great site you can recommend, for inspiration, or that is helpful in your day to day life? Please let me know in the comment section, I would so appreciate it! One recommendation I'd like to pass on is commonsensemedia.org, a searchable site for books, movies, tv shows, websites, games to see exactly what questionable material they may or may not contain to help you gauge what will be appropriate for your kids. Many times, for example a new movie comes out my kids want to see, and often we pass on them because they contain language I don't want my kids to hear (even Disney), but they also give you a breakdown on the violence, themes, consumerism etc. It has been very valuable resource and often spares exposing my kids to things they shouldn't see or aren't yet ready. Hello! Time for a Color Spotlight challenge with Gina K and StampTV! Today's "Where Your Heart Is" card has just a few layers and no DP, I really wanted to focus on this fresh color combination. Cardstock is Pure Luxury White for the images, Red Hot mat and Sweet Corn as a base. Hope you'll have time to play this week, remember to use the tag STVCSP8 when uploading your new creation with this color combo to STV! Good luck, I hope you win some free stamps! Just don't give up trying to do what you really love to do. Where there is love and inspiration, I don't think you can go wrong. I wanted to share a design you can use for soldiers to send back home thrugh Operation Write Home, with the simple "love you" greeting stamped into the heart this could be used any time of year! This camo print DP is from The Paper Studio, found it at Hobby Lobby. Simply cut some wavy rectangles with a straight edge on one end for the sleeve opening to make the fatigues! Then use scissors or a craft blade to crop the far ends on the sides of the card. Cardstock is Gina K Pure Luxury White, Red Hot and In the Navy. Layers are Cuttlebugged with Stars and Heart Blocks and sponged with Antique Linen and Vintage Photo Distressing Inks. As I wrote on the OWH blog, I am a disabled veteran and have deployed in the past, leaving my four children behind. It was very important to them to hear from mom and now, making cards for OWH, I can help other military folks keep in touch with their loved ones. It is a beautiful set, thank you! Congrats, Penny please send me your snail address within 48 hurs to claim your prize so I can send you your set! Be sure to check out the "Stars and Stamps" blog, too for the other winner! Thank you again Gina for donating the sets! Do you have questions about Operation Write Home and want to get some cards in the mail to them? Be sure to check out this page on how to get involved, as well as the mailroom page on some info about shipping cards! I used some scraps of Basic Grey Curio DP I had leftover from yesterday's card I shared to make some simple sleeves for the "Where Your Heart Is" hands (these scraps already had this black border on the edge, hee!). TIP: Use straight rectangles for fuller sleeves that would hang or cut them to taper to make a more fitted sleeve. I made this for one of the mentoring mom's in my small group ("Thank you for your prayers"), she prays for me every week and I know God has been answering so many of those prayers! Kraft mat is Cuttlebugged and sponged with Vintage Photo ink, I also used Pure Luxury White, Black Onyx and Cranberry Tart. Winners of the "Where Your Heart Is" blog candy sets tonight! Be sure to check back! Here is a card I shared at the release party, a fun vintage look complete with an adhesive pearl bracelet (hee!) and some Basic Grey Curio Paper, sponged with Vivid Coffee Bean on the top and right side to match the dark printed border on the other edges. I used the little label and greeting from the Free with Three "Smile" set, I like how the Label Eight shaped image looks on just one side of the Labels One Die cut. I hope this cards give you lots of ideas for different ways the hands can be cropped other than just the rectangle to incorporate into your different layouts! It makes me want to do more and I've discussed with Sandy, president of Operation Write Home, what OWH needs MOST right now (since they also need money to ship the cards), but she immediately replied their greatest need is CARDS, they estimate they need DOUBLE the amount they did last year to meet their current needs. So I would like to personally send them ONE card for every "Where Your Heart Is" set that sells this month! I think I can do it, I have a ton of cards around here (and as you know, am always making more!) Reading about their great need, and how much it means to these people, I can't think of a better thing to do with them. And if YOU buy the set, I'm wondering, if you might be interested in also sending a card to OWH? (Or maybe a couple to make up for those who can't.) The OWH site has lots of helpful info about how to prepare your cards, and who to send them to, plus a very informative and fun video showign you how they process them, check it out! See you soon, thanks for visiting! This blog candy is now closed. 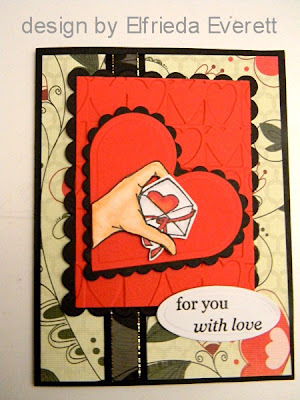 for my new set from Gina K Designs "Where Your Heart Is", a set of stamps for cards for heroes and from heroes!! This set is going to see a lot of love from me in making cards for my heroes at home and overseas, and I know from our Gina K fans' comments this past week it will from you, too! The set is getting attention in other places as well, more exciting news about that soon! I will be posting my tip sheet for the set shortly which will be an awesome resource for sentiment combinations, and of course lots of new samples with the set, more designs and tutorials specific to OWH for your inspiration, and more, so please stop back! if you are not currently subscribed or a follower, I would love for you to do so, see the sidebar on the right for options. Color Challenge and New Stamps are now Available! Good morning! New stamps are available, check them out here! Tip sheet for "Where Your Heart Is" coming soon, today I have short tutorial using the set. Time for another Color Spotlight Challenge! Be sure to upload you creation to STV with the tag STVCS7 for a chance to win free stamps! Here is a sample I made for my little boy, he draws pictures for me all the time, so I made him a simple card to show him how special his creations are to me! Of course, this "pictures" sentiment could also be talking about photos, that was intentional, so family members can convey their appreciation for things given or mailed. The way the sentiment is arranged, you can also add "letters" or "prayers" in place of pictures. TIP: Stamp the sentence first, then add the single word on a grid line block, lining up the line under your stamp with the your on your already stamped greeting and then stamp. First color, the bottom of the hands, underside of fingers at top and thumbs with the lightest flesh tone you will be using, I used E00, as my hands are pretty pale!! Leave the very top sides white. Now go in and color the underside of the hands, thumbs with a darker flesh tone, here E21. Also lightly trace, the creases on the insides and undersides of fingers. Stop here for a more dramatic look. Go to the next step for a more blended look. Have a great weekend, thanks for joining us at the party last night if you missed it, the thread is still up you can go check out what you missed! Sneak Peek Day 4: "Gleefully Yours" and "Smile"
Welcome back to our last day of Gina K Designs Sneak Peeks! First up we have the "Free with Three" set "Smile", so fun! (have you picked out your three sets yet?) ;) You get this cute dotted label that fits the Labels 8 Nestabilities and cute senitments and images to go with. I stamped it in Vivid Coffee Bean and then colored the rim of the oval with a YG03. Dp is Basic Grey Marjolaine, this pattern is so fun with the dotted label and dotty tree border! I nked up the greetings with blue and brown markers before stamping to highlight "brighten" and punhced out this cute little flower with the Marvy flower punch and added a button to the center. I trimmed out some simple leaves from Pure Luxury Creme De Menthe and scored them in middle folding and curling them with my fingers to add dimension before adhering them under the popped up flower. I cut the scalloped border using some decorative scissors. Next we have Nina Brackett's new set "Gleefully Yours", filled with musical images and sentiments. The first thing I thought of when I saw this set was spotlighting the microphone, by stamping it on a rectangle of white CS, then covering the middle with a mask, leaving a diagonal space open at each corner to sponge in some black ink, sponging heavier at the corners and with a lighter touch toward the mask. Doesn't this look illuminated and take center stage now? The B&W color scheme and clean lines mixed with the fancy details make for a nice art deco look. I matted it onto Black Onyx and stamped the wavy staff behind it in Memento Tuxedo Black on White Pure Luxury. For just a hint of bling I added a silver metal adhesive dot to the microphone. Check out the rest of our Gina K Designs team for more inspiration with these two sets and leave comments for chances to win the sets free! I hope we will see you tonight at the party on StampTV at 7 PM CST! See you tonight at the party!!! Welcome to Day 3 or our Gina K sneak peeks! Are you ready for a new STV kit? You are sure to fall head over for heals for Gina's new "Sent with Love"! In addition to lots of yummy supplies like Pure Luxury Cardstock in an assortment of love-ly colors, you are gonna flip for all these cute images and sentiments! Usually, I am immediately drawn to one image in a set that I want to make my sample with but here I didn't even know where to start, they are all so adorable! I *might* have been craving some sugar though, so I started with candy! 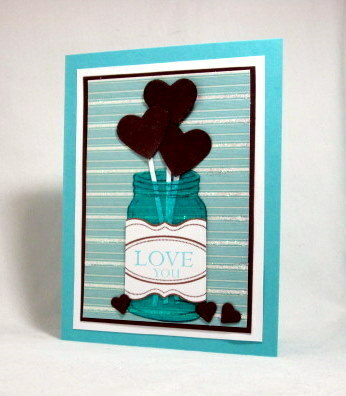 :) I thought this curvy machine would be perfect framed in a Labels 14 die cut and colored with classic Valentine colors! The machine is R37 and R59, with a bit of BG000 on the glass bowl. Candies are colored with R37, R83, and RV19. I also covered each heart with a little Sakura Glaze pen. I popped up two cut candy hearts for the bottom, see how nicely they balance out the greeting and how beautifully the offset greeting fits into the Nestabilitie? The bottom of the Lipstick Red mat is embossed with a Cuttlebug flourish border. Base is Pure Luxury White. Check out more StampTV kit samples from the Gina K designs team and leave comments for more chances to win this new kit! See you tomorrow for our last day of peeks and the party later that evening, 7 PM CST! Sneak Peek Day 2: "Dino-mite" and "Hopeful Hearts"
Welcome back to our peeks!! Theresa Momber has created a "Dino-mite" set this month, full of fun loving creatures and sentiments! She was very clever in her choices of greetings, even if you don't have young kids or little boys, your best girl friend will get a kick out of a birthday card "from one old fossil to another!" hee! I found this fun paper in the Basic Grey Marjolaine pack, looks so festive and a great match with the Triceratops spots, and it made choosing Pure Luxury CS to go with a snap: Little Boy Blue , Chocolate Brown and Fresh Asparagus. The little party hat is separate from the dino image so I thought two would be twice as fun to go on the horns, now THAT'S partyin'!! To color his skin, I used only ONE green: Copic YG93, love this pretty pear shade. Color the whole dino with one coat, then go back and lay down a second and third coat for your shadows just by tracing his undersides. Horns, nails, spikes and spots are Y35 and YR23, eyes and hats are B12 and B95, shadow is W-3. I did some piercing and framed my image and one sentiment in circles to match the print, these wonky mats for the other greetings give the card a lot of energy, like you're shoutin' them out, woo hoooo! Next we have "Hopeful Hearts" by Tami Mayberry. This set contains another pretty square block image you can cut out with your Nestabilities, here I used Labels 15, with a "two step" heart to go in the middle. I stamped mine in Vivid Brick and then added some little rhinestones to the flourish before cutting it out and popping it up over the frame. The Red Hot mat is Cuttlebugged with Victoria and then sponged with cranberry ink for a deeper look. I stamped one of the small hearts onto Silver Lining CS in Stazon Jet Black and then cut it out to make the little charm hanging from the blinged up 5/8" gingham. Punched flourish and base are Black Onyx. Here is more inspiration for both sets from our Gina K Designs team! Don't forget to leave some comments for chances to win these two new sets! Sneak Peek: "Where Your Heart Is" and "Ready, Set, Snow!" Welcome to our first day of Gina K Designs January Sneak Peeks! First up we have my newest set, "Where Your Heart Is", which began with an idea over two years ago and has evolved over time. Stamping has really broadened my horizons in so many ways; beyond crafting, I've met people with common interests but very different life experiences, many who are wives of men serving in the military, like Beate Johns, Emily Giovanni, and Carolyn King. It made the sacrifices that everyone makes in a family where a spouse is away SO real for me, I started thinking about doing a special set to honor people like them and that family members can send to each other. Hands are shaded with E00 and E21 (I will share a tutorial after our peeks are over, very easy to do), I colored the heart in between the hands with R37 and R59 and then sponged Antique Linen Distressing ink around the outside. A very simple way to show your love for someone, even my little boys know what this means! On the card below I used the same focal point but changed up the layout slightly to add a greeting. I could make a card every day with this set for all the people I owe thanks for making my life and the world a better place and those who are in need of prayers, and I still wouldn't be finished, but I'm glad to have sentiments that makes it so easy to express what I'm feeling. And finally one to a friend whose father is very ill. Paper is Pure Luxury Black Onyx, Kraft and Basic Grey Curio, hands are pieced on top with White Pure Luxury and colored with the same Copics listed above. Perhaps more than any other past set I am so anxious for you to see all the greetings you'll be able to create from the sentiments provided, this set is very near and dear to my heart, but this peek is only a *tiny* peek of what you can say to show your support! Next up we have Rupa's "Ready, Set, Snow!" It's finally getting chilly in Texas, so it's fun to pull this out now even post Christmas, but, of course still, no snow here!) I asked my kids to pick which image I should use and I knew they would both pick this one! They've only been sledding a few times but those are favorite memories of snow. I cut the white Pure Luxury layers with a rotary blade to make easy curves fro sliding and popped out the colored and cut penguins. DP is exclusive to Gina K Designs and base is Lipstick Red. TIP: use shades of blue instead of black on the penguin to add some whimsy and make a better, "cooler" match for your snowy background. I used B66 and B37 for the penguins, BG000 for the shadows, Y35 and E07 on the feet and beak, R37 and R59 on the sleds. 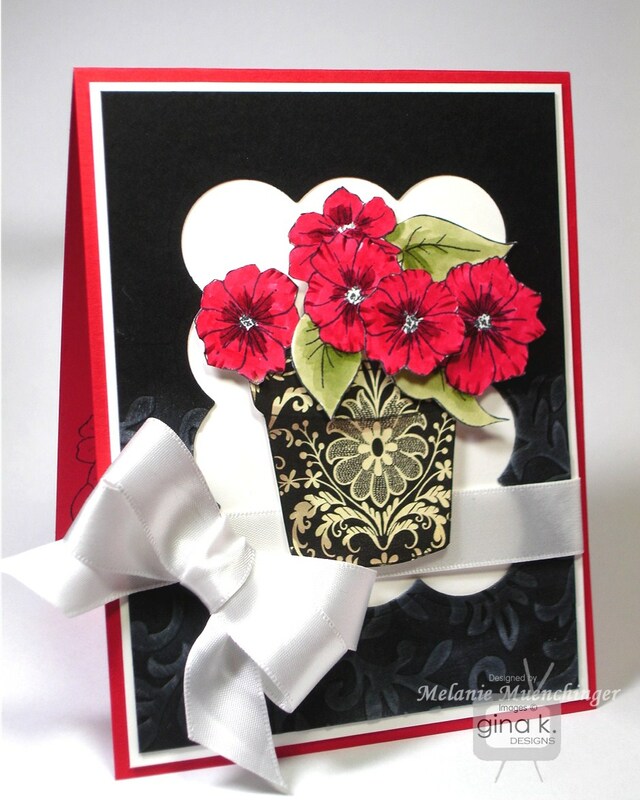 The rhinestones flourishes are fun to add both bling and energy to the card! Thanks for joining us for our first day of peeks! Have fun hopping to the other blogs from our fabulous design team!